As I discuss at some length in my new book on Dynamics of Identity in the World of the Early Christians, members of associations could feel a real sense of belonging in the group, and at times this sense of identity could express itself in rivalries with other groups. Christians and Judeans were not the only ones involved in rivalries or tensions with other groups within society. In fact, alongside areas of cooperation, competition was an inherent aspect of life within cities in the Roman empire, and associations sometimes took part in this. Among the more interesting examples of rivalries between different associations (or collegia) is a riot that took place in Pompeii in the first century (59 CE). 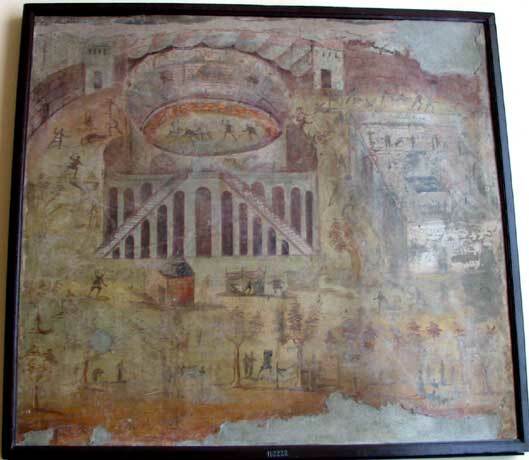 This is one of those rare cases when we have more than one source regarding a violent incident involving associations, one of them being a painting from Pompeii. About this time there was a serious fight between the inhabitants of two Roman settlements, Nuceria and Pompeii. It arose out of a trifling incident at a gladiatorial show . . . During an exchange of taunts — characteristic of these disorderly country towns — abuse led to stone-throwing, and then swords were drawn. The people of Pompeii, where the show was held, came off best. Many wounded and mutilated Nucerians were taken to the capital. Many bereavements, too, were suffered by parents and children. The emperor instructed the senate to investigate the affair. The senate passed it to the consuls. When they reported back, the senate debarred Pompeii from holding any similar gathering for ten years. Illegal associations in the town were dissolved; and the sponsor of the show and his fellow-instigators of the disorders were exiled (Annals 14.17; trans. by Michael Grant, The Annals of Imperial Rome [London: Penguin Books, 1973], 321-22). Tacitus’ account shows us that rival associations from the two different cities played an instrumental role in the conflict. So both civic and group identity played an important role here. Such rivalries would not always lead to violent conflict, however. The second piece of evidence is a painting that can now be seen in the National Museum of Naples. In the painting is pictured people fighting in and around the amphitheater. Why exactly someone would have this painting commissioned is not completely clear. Were they proud of the incident since their fellow Pompeiians had gained the upper hand in the rivalry? Did they know some members of the associations involved? Or is the painting reaffirming the action of the authorities in quelling and preventing such civic disturbances? Was it made to celebrate the re-opening of the amphitheater after the imperial prohibition was lifted? From the Casa della Rissa nell’Anfiteatro, or house of Actius Anicetus (inventory no. 112222). Inscriptions depicted on the walls of the palaestra (to the right of the amphitheatre) proclaim: “Good fortune to D. Lucretius” (in Latin) and “Good fortune to Satrius Valens, Augustus Nero” (in Greek). Photo by Phil. Full Italian description in Bragantini and Sampaolo, La Pittura Pompeiana, p.512-13. Categories: Identity in the world of the early Christians, Pompeii. September 16, 2009 .